It is conspicuous that Audible audiobooks cannot be directly downloaded to MP3 players or played back on unauthorized devices due to the DRM protection and format incompatibility. Fortunately, there are some solutions that are feasible and powerful for getting over the problem. And there are professional programs that are well versed in removing the DRM from Audible audiobook and convert AAX to MP3. If you like listening to audiobooks, then you should be no stranger to Audible.com. As a renowned audiobook producer and seller, it offers all kinds of audiobooks. 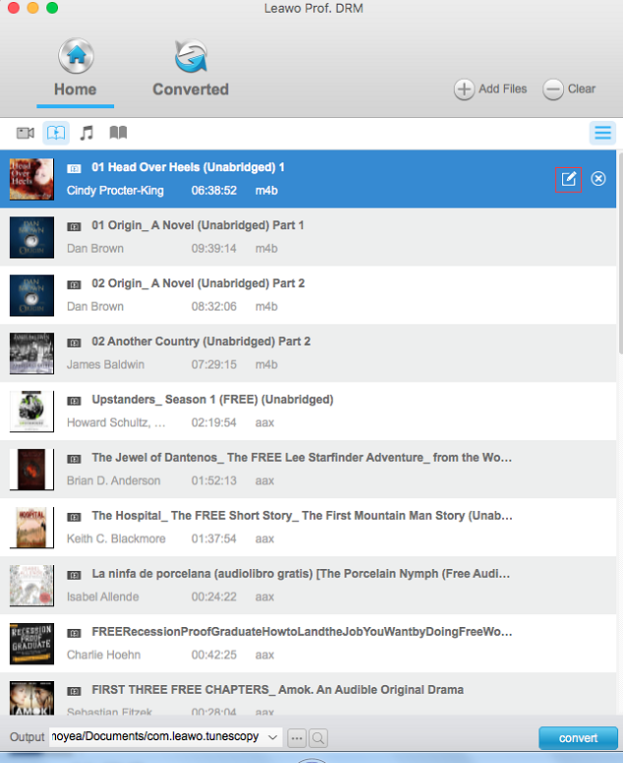 And it is also a great online service which allows its subscribed users to download and listen to audiobooks on Mac. Its developed programs and apps are almost available for many platforms. And on authorized devices, you can listen to Audible audiobooks smoothly. First thing first, the best DRM removal software would be needed so as to convert Audible to MP3 on Mac. 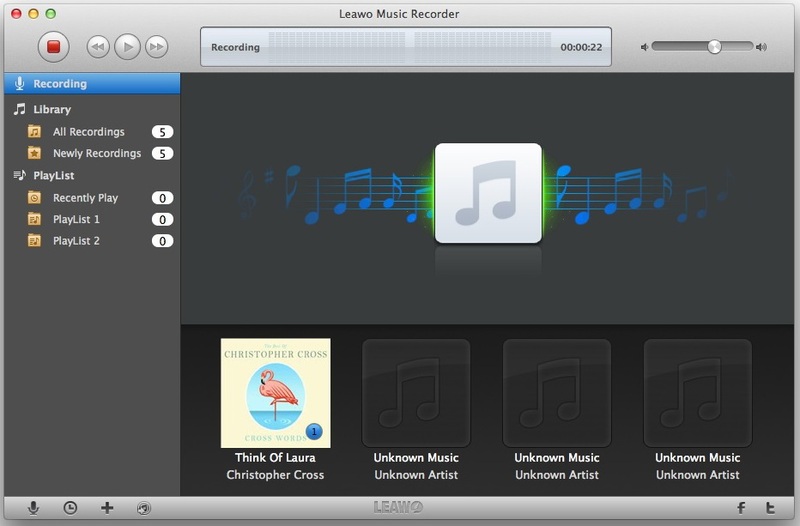 And it is said that the most welcomed and commonly used DRM removal tool on Mac would be Leawo Prof. DRM for Mac, which has already gotten the word of mouth among so many users who had been stuck by DRM limits and format incompatibility of Audible files. As an extraordinary DRM removal program, it can remove DRM from any media content from iTunes and Audible. For example, DRM on iTunes music, audiobooks and video and Audible audiobooks can be all removed with this program. And this tutorial here is all about removing DRM from Audible audiobooks on Mac. It removes DRM from Audible files and converts them to MP3 in simple steps. After that, the converted MP3 file can be directly transferred to your mobile phones, MP3 players and any other devices for listening. Prof. DRM is quite user-friendly so that even an amateur can make it readily. Follow the guide to check out how to use this audible to MP3 converter on Mac to convert Audible files to MP3 from the content below. After downloading and installing Prof. DRM for Mac on your Mac PC, just launch the program and get down to business. 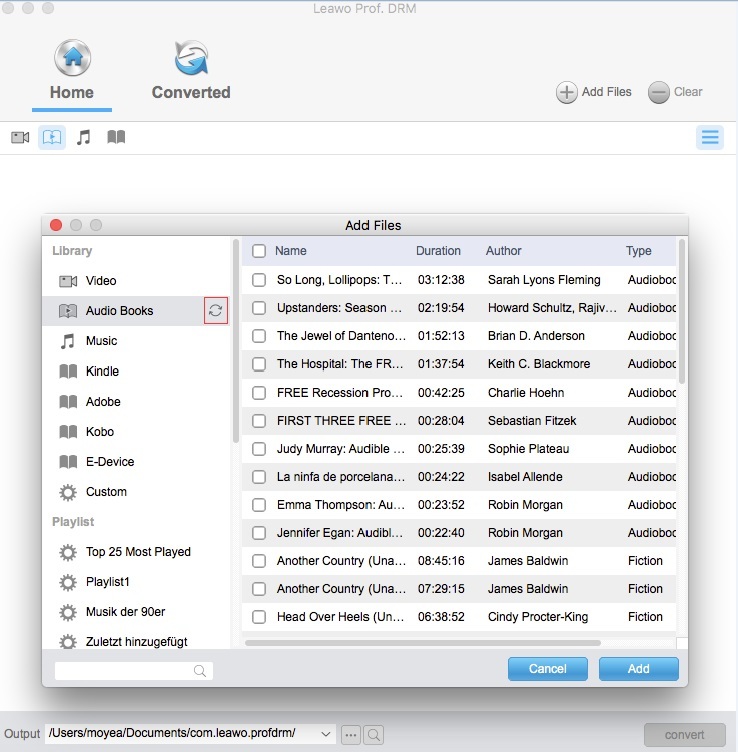 Enter the main interface, and then click on the “Add Files” button for adding Audible files to the program. 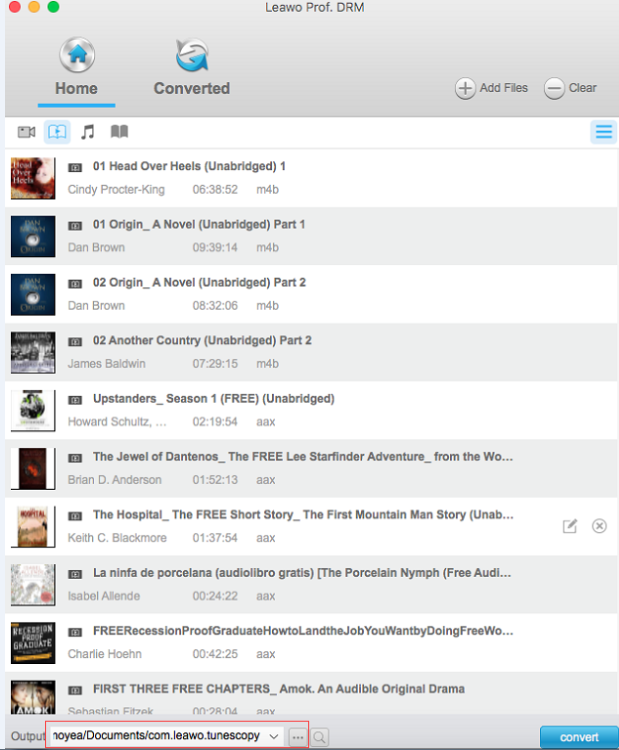 Or you can drag the Audible audiobook files and drop them to the middle of the program directly. The “Clear” is also available if you prefer to delete all the added files. After importing the target audible AA/AAX audiobooks, you can check these audiobooks on the “Audiobook” module. And then you can choose an audiobook file and click on the “edit” button to set MP3 as the output format and what’s more, customize the parameters as you need by setting the Channels, Sampling Rates and Bit Rates for keeping in the output MP3 audio file. At the bottom of the interface, you will see an output directory box. Click “…” button next to it to select an output path for saving the output files. Once all settings complete, click on the “Convert” button at the bottom to start removing DRM and converting Audible files to MP3. And the DRM removal and conversion process will be finished in seconds. Go to the “Converted” panel to view all the converted MP3 files when the converting process comes to an end. In this panel, you are allowed to open the converted MP3 file or fast locate the file through the quick searching bar at the bottom of the interface. 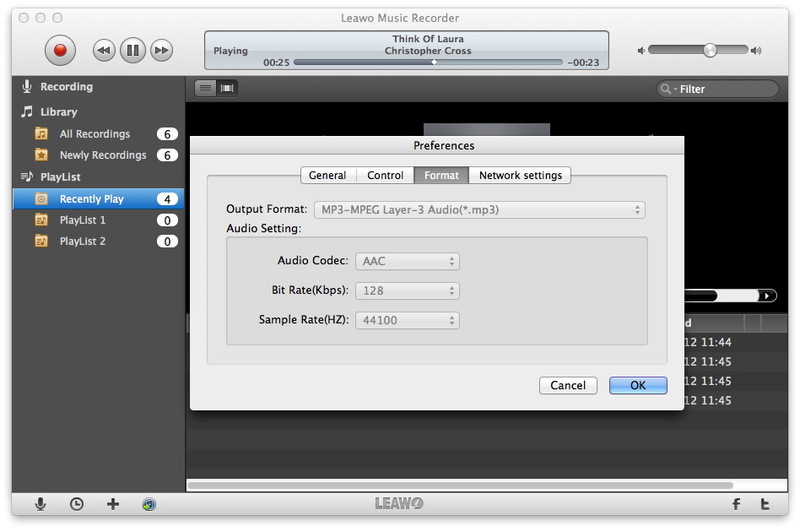 To convert Audible to MP3 Mac, Leawo Prof. DRM is absolutely one of the best choices you can easily be proficient. With no complicated interface and operation involved, you can easily be well versed on how to convert audible files to MP3 with DRM removed at the same time. Listening to your Audible audiobooks on unauthorized MP3 players would become a real possibility with the help of this program. Also, if you have downloaded some audiobooks from the iTunes Store, this program will remove DRM from your iTunes audiobooks and get them played on your MP3 players as well. 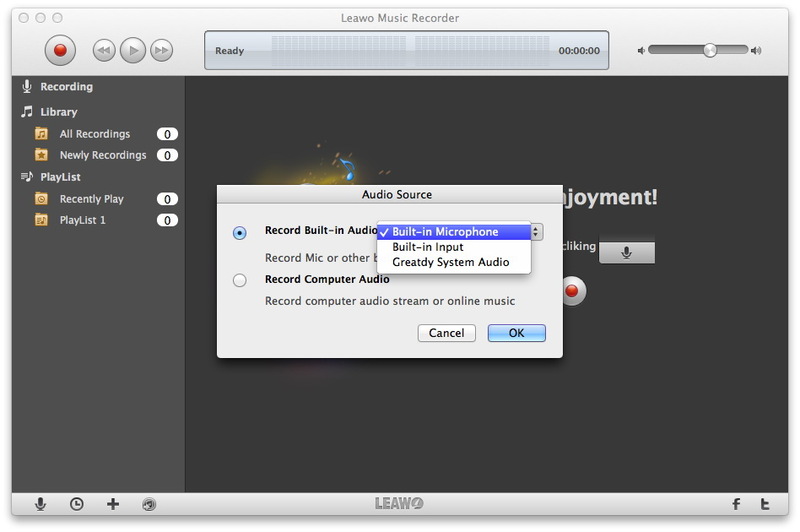 Launch the program and enter the main interface, click on the “Audio Source” icon to choose “Record Computer Audio” option which is for recording computer audio stream and online music. Afterwards, you can also click the “Recording task scheduler” icon to invoke the Task Scheduler to set the recording Start time and Duration if necessary. Go to “Preferences” setting panel, click “Format” to select MP3 as the output audio format and customize the parameter settings if you need. Return to the main interface after you finish all settings, and then click the red “Start” button to start recording and play your Audible audiobooks right away. And then your DRM-free MP3 audiobooks will be automatically saved after the recording completes. Now you can transfer Audible files in MP3 to your mobile phones, MP3 players or any other portable devices and listen to your Audible Audiobooks freely. As a matter of fact, the open source and free solution would be also attractive for users seldom using MP3 players to listen to Audible audiobooks. And indeed, there is a free tool—Requiem that can help you convert Audible files to MP3. Requiem, as a DRM removal tool, was originally developed to remove DRM from Apple multimedia so that other devices or systems can freely play iTunes contents. And the latest Requiem for Mac can remove DRM blocks and decrypt most files within seconds or minutes. 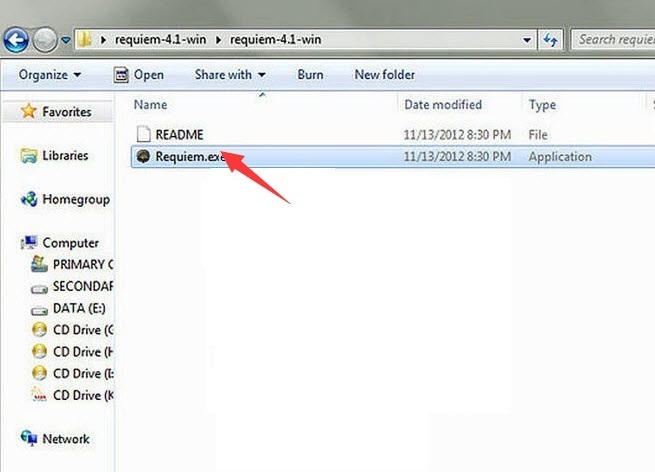 Moreover, as Requiem does not decode the files themselves, the original quality of the files will be retained. With the lucid guide below, you can effectively convert Audible files to MP3 in a while. Step 1: Run Requiem on your Mac and it will automatically scan your DRM protected files. Step 2: Remove DRM from Audible files. And the protected Audible files will be replaced by the entirely unprotected files after the DRM removal is finished. Step 3. Congratulations! You’ve successfully removed the DRM from your Audible files. The DRM free Audible audiobooks will be played on unauthorized devices and whatever media players you want. You can just feel free to listen to your Audible audiobooks. The three solutions mentioned here are all helpful for Audible audiobook DRM removal. And they have their own features respectively for their own goals. Now you can check the table below to compare the three programs and choose the one you think help you most. Support converting iTunes videos, audio and books, Audible audiobooks and so on. Support converting iTunes videos, audio and books and decrypt most DRM files. Not available for DRM removal from iTunes rental media content.